Born in Brooklyn, New York as Joseph Vincent "Joe" Paterno on 21st December, 1926 he became one of the well known American college football coach which holds the record for the most victories by an NCAA Division I Football Bowl Subdivision (FBS) football coach with 409. Joe Paterno was the head coach of the Penn State Nittany Lions for 46 years, from 1966 through 2011. Nicknamed "JoePa", he coached five undefeated teams that won major bowl games and, in 2007, was inducted into the College Football Hall of Fame as a coach. Penn State is one of just eight teams with 800 wins all-time and Paterno has been a member of the Nittany Lion staff for 505 of them -- 62 percent of the 818 all-time total. Penn State owns a record of 505-183-7 (73.3) since Paterno joined the staff in 1950, the nation's third-highest winning percentage. He has missed just three games of a possible 695 Penn State contests over 61 seasons. Since Paterno began leading the program in 1966, Penn State has had 78 first-team All-Americans, with guard Stefen Wisniewski earning the distinction in 2010. Wisniewski was selected first team All-Big Ten for the second consecutive year and a National Football Foundation Scholar-Athlete. He was joined by senior tailback Evan Royster as a three-time all-conference honoree. During Paterno's remarkable tenure, the Nittany Lions have counted 16 National Football Foundation Scholar-Athletes, 37 first-team Capital One/CoSIDA All-Americans® (47 overall) and 18 NCAA Postgraduate Scholarship winners. Penn State has had at least one Academic All-American® in each of the past nine years, with 13 first team honorees since 2006.
p>Winner of the 2005 Butkus and Bednarik awards, All-America linebacker Paul Posluszny was selected the 2006 CoSIDA Academic All-American®-of-the-Year in Division I football and was a two-time first team Academic All-American®. Penn State's 89 percent graduation rate and 85 percent Graduation Success Rate were tops among all teams in the Associated Press' final 2009 Top 25 poll, according to NCAA data. The Nittany Lions' GSR and four-year federal graduation rate were second only to Northwestern among Big Ten Conference teams, according to the NCAA's 2010 graduation report. Paterno's coaching portfolio includes two National Championships (1982, 1986); five undefeated, untied teams; 23 finishes in the Top 10 of the national rankings; an unprecedented five AFCA Coach-of-the-Year plaques, and more than 350 former players who have signed National Football League contracts, 32 of them first-round draft choices. All-America defensive tackle Jared Odrick was a 2010 NFL first round draft choice by the Miami Dolphins and defensive end Aaron Maybin was the No. 11 overall choice in 2009. His teams have registered seven undefeated regular-seasons and he has had 35 teams finish in the Top 25. Penn State has won the Lambert-Meadowlands Trophy, emblematic of Eastern football supremacy, 24 times in Paterno's coaching run, including in 2008 and `09. Since 1966, there have been 883 head coaching changes among Football Bowl Subdivision programs, an average of more than six changes per I-A institution! (Includes 22 changes after 2010 season). Paterno is the only coach to win the four traditional New Year's Day bowl games -- the Rose, Sugar, Cotton and Orange bowls -- and he owns a 6-0 record in the Fiesta Bowl. He was selected by the National Football Foundation and College Football Hall of Fame as the first active coach to receive its Distinguished American Award. Paterno also was the 1986 Sports Illustrated Sportsman-of-the-Year. A member of the Nittany Lions' coaching staff spanning the administrations of 13 U.S. presidents (starting with Harry Truman), Paterno passed Bryant on October 27, 2001 when the Lions secured his 324th victory by rallying from a 27-9 deficit to defeat Ohio State, 29-27, in the greatest Beaver Stadium comeback under the legendary coach. Obviously not a person of misplaced priorities, Paterno always has concentrated on seeing that his student-athletes attend class, devote the proper time to studies and graduate with a meaningful degree. He often has said he measures team success not by athletic prowess but by the number of productive citizens who make a contribution to society. The 2009 NCAA Graduation Rates Report for Division I institutions revealed that the Penn State football program earned an 89 percent graduation rate among freshmen entering in 2002-03, which was No. 1 among teams ranked in the 2009 final Associated Press poll. Penn State's figure was an astounding 34 points above the 55 percent FBS average. The NCAA data also showed that Penn State posted a program record 85 percent Graduation Success Rate, also the highest among 2009 AP Top 25 teams. The national average among FBS teams was 67 percent. Paterno is not fond of looking back, but it has been a memorable period for the legendary mentor, who has been a member of the Penn State staff for 695 games. In January 2011, NCAA President Mark Emmert presented the Gerald R. Ford Award to Paterno at the NCAA Convention. The award honors an individual who has provided significant leadership as an advocate for intercollegiate athletics on a continuous basis throughout his or her career. "For me, Coach Paterno is the definitive role model of what it means to be a college coach," said Emmert. In December 2010, the Big Ten Conference announced the winning team in the Big Ten Football Championship game will earn the Stagg-Paterno Championship Trophy. The trophy pays homage to Paterno and Amos Alonzo Stagg, who won 199 games at University of Chicago when the Maroons were Big Ten members. Paterno ranks fifth among Big Ten coaches all-time with 154 wins since the Nittany Lions began conference play in 1993. Stagg's win total is second-highest total in Big Ten history. "It's an honor for our family and Penn State to have my name associated with the Big Ten Championship Trophy," stated Paterno, who is the Big Ten's all-time post-season victories leader (10-4 mark since 1993). The Maxwell Football Club announced in March, 2010 it was re-naming its top college coaching honor the Joseph V. Paterno College Coach of the Year Award. "The Maxwell Football Club is privileged to honor the legacy of Coach Paterno, his values and his successes on and off the field," said Executive Director Mark Wolpert. In 2009, Paterno banded together a squad of highly-motivated and dedicated student-athletes and coaches into a squad possessing outstanding work-ethic, commitment and senior leadership delivered the Nittany Lions' fourth bowl victory in the past five seasons with a hard-fought, thrilling last-minute win over LSU in the Capital One Bowl. The 2008 and `09 Nittany Lions earned consecutive 11-win seasons for the first time since 1985 and '86, when Penn State played in back-to-back National Championship games. Paterno's 21st season with double figure victories and 23rd team to finish in the Top 10 added to the litany of coaching records he owns. The Nittany Lions won at least 11 games for the 15th time under the Hall of Fame coach. The 2008 Nittany Lions and their head coach displayed resiliency and toughness to capture the Big Ten Championship and the program's second Bowl Championship Series berth in four years. Trailing rival Ohio State in the fourth quarter in a late October night game, the visiting Nittany Lions made a momentum-swinging play and went on to score the game's final 10 points to post a hard-fought victory en route to their third Big Ten crown. Paterno also was resilient, as he fought through a hip injury that occurred two days before the 2008 season-opener, displaying toughness and fortitude to his squad when in obvious pain. The day after the Big Ten-clinching win over Michigan State, Paterno had successful hip replacement surgery and led the Nittany Lions during their preparations for the Rose Bowl clash with Southern California. Paterno was selected the 2008 Big Ten Dave McClain Coach-of-the-Year, winning the honor for the third time, second only to Bo Schembechler's four selections in the award's history. He also was a finalist for three national Coach-of-the-Year honors: the Eddie Robinson Award (FWAA), Liberty Mutual and George Munger (Maxwell Football Club). Penn State earned an 11-2 mark in 2008, finishing No. 8 in the Associated Press and USA Today Coaches polls. A school-record 10 Nittany Lions were selected first-team All-Big Ten, more than double the second-highest total, and a record 14 players earned first or second-team all-conference accolades. Four Nittany Lions received All-America honors and A.Q. Shipley became Penn State's first recipient of the Rimington Trophy, presented the nation's outstanding center. It was a record-breaking year for academic accomplishments as well. A program-record five players were selected to the 2008 ESPN/CoSIDA Academic All-America® team, with four on the first team. Penn State's four first-team selections and five overall selections led the nation, becoming the first school to have five Academic All-America® football players since Nebraska in 1997. A program record 55 Nittany Lions earned at least a 3.0 grade-point average during the Fall 2008 semester. Among the 55 football student-athletes, a record 19 garnered Dean's List recognition by posting a 3.5 GPA or higher. In December 2008, Paterno agreed to an extension through the 2011 season. In 2007, Paterno was inducted into the National Football Foundation and College Football Hall of Fame. The five-time National Coach-of-the-Year was selected for induction in 2006, and was set to join two more legendary coaches -- Bobby Bowden and John Gagliardi -- as the first active coaches or players to be inducted into the Hall of Fame. Coach Paterno's induction, though, was deferred until 2007, as the injuries he sustained during a sideline collision in a November game at Wisconsin prevented him from traveling to the 2006 event. "I have mixed feelings because there were so many people that are not with me anymore who made it possible for me," stated Paterno during the December 4, 2007 induction ceremony. "How good has it been? What we share in football; there's never been a greater game. We've been involved in the greatest game, the greatest experience anybody could hope for. Great teammates. Guys you could trust. Guys you loved. Guys you would go to war with tomorrow. We're so lucky...we're so lucky. If we lose what we have in football, we'll lose an awful lot in this country and we've got to remember that." Paterno and Bowden, who rank No. 1-2 in victories among major college coaches, received the prestigious Gold Medal, the National Football Foundation's highest honor, at the 2006 Hall of Fame Dinner via a video presentation. The 2007 season saw Paterno reach two more significant milestones and one tremendous honor. He eclipsed another college football legend, Amos Alonzo Stagg, for longevity at one institution among major college coaches. Stagg was a head coach for 57 years, including 41 at the University of Chicago. In December 2007, Patrick and Candace Malloy honored Paterno's contributions to the University by committing $5 million to create the Malloy Paterno Head Football Coach Endowment at Penn State. "All of Penn State has benefited from Joe's commitment to success with honor," said Patrick Malloy, a 1965 alumnus of the University. "He is so much more than a coach -- he's an educator. He teaches his players how to win in life as well as in football, and he teaches every Penn State fan how to make the world a better place through integrity, honesty, and excellence. We are also fortunate enough to know Sue Paterno, and we have the deepest admiration for her volunteer and philanthropic leadership at Penn State and beyond." The Nittany Lions' capped 2007 by defeating Texas A&M in the Valero Alamo Bowl in Paterno's 500th game as head coach. Penn State made another January bowl appearance under Paterno in 2006 and defeated Tennessee, 20-10, in the Outback Bowl. It came as no surprise that less than two weeks after undergoing surgery on his left leg in November 2006, Paterno was back in Beaver Stadium, observing his team from the coaches' booth for the regular-season finale against Michigan State. The 2005 Nittany Lions are a squad the legendary coach also will remember fondly. The players and coaches passionately toiled every day to return Penn State to the national championship picture. The Nittany Lions compiled an 11-1 record, captured the Big Ten Championship and a thrilling triple-overtime decision over Bowden's Florida State squad in the FedEx Orange Bowl. The 11-win season represented another milestone, as Penn State recorded at least 10 victories under Paterno in a fifth decade and for the 19th time overall. The Nittany Lions were No. 3 in the polls, earning their 13th Top 5 finish under the veteran coach. For his leadership in restoring the Nittany Lions to the nation's elite, Paterno was recognized with numerous National Coach-of-the-Year honors in 2005, capped by an unprecedented fifth selection by the American Football Coaches Association (AFCA). He also received national honors from the Associated Press, Bobby Dodd, Home Depot/ESPN, Maxwell Football Club (George Munger), Pigskin Club of Washington, D.C., The Sporting News and the Walter Camp Football Foundation. In an exceptional display of generosity and affection for Penn State, Paterno; his wife, Sue, and their five children announced a contribution of $3.5 million to the University in 1998, bringing Paterno's lifetime giving total to more than $4 million. The gift was believed to be, Penn State Vice President for Development Rod Kirsch said, "the most generous ever made by a collegiate coach and his family to a university." The Paterno gift endows faculty positions and scholarships in the College of the Liberal Arts, the School of Architecture and Landscape Architecture, the University Libraries and supported two building projects -- a new interfaith spiritual center and the Penn State All-Sports Museum, both on the University Park campus. The museum opened in 2002 and the spiritual center was dedicated in 2003. "Penn State has been very good to both Sue and me," Paterno said. "We have met some wonderful people here, we've known many students who have gone on to become outstanding leaders in their professions and in society, and all of our children have received a first-class education here. I've never felt better about Penn State and its future potential than I do right now. Sue and I want to do all we can to help the University reach that potential." He and Sue have been actively involved with the Special Olympics Pennsylvania Summer Games, held each June on the University Park campus. In 2008, the Paternos were inducted into the Special Olympics Pennsylvania Hall of Fame. The Paternos announced a $1 million pledge in 2009 for the Mount Nittany Medical Center. Their gift is part of the most ambitious fundraising effort in the Medical Center's history and helped support a three-floor, 42,000-square foot expansion of Centre County's primary health facility, which was completed in 2010. Also in 2009. the Paternos were honored by the Charcot-Marie-Tooth Association for a lifetime of achievement. Coach Paterno is a national spokesperson for CMTA. A pair of Paterno's donated personal items recently have raised funds and awareness for Penn State Public Broadcasting. In 2011, the tie he wore in his 400th win was auctioned for $10,200. In 2010, a pair of Paterno's glasses made national headlines, as a Penn State couple bid $9,000 to purchase the donated, autographed specs. In 2006, Paterno was bestowed a trio of diverse honors in addition to the Hall of Fame announcement and Gold Medal presentation. He was named a Free Spirit honoree and recognized by The Freedom Forum at the National Press Club in Washington, D.C. In April, Paterno received the Lifetime Achievement Award from the Dapper Dan Charities in Pittsburgh and received the History Makers Award, presented by the Senator John Heinz Pittsburgh Regional History Center. Paterno was recognized twice for his illustrious career in 2004. He was selected the second-best college football coach of all-time by a panel of more than 300 media, current and former football coaches, Heisman Trophy winners and members of the College Football Hall of Fame. Paterno also was chosen the nation's best college football coach of the past 25 years by an ESPN25 expert panel. He finished No. 8 overall in the listing of college and professional coaches from all sports over the past 25 years. 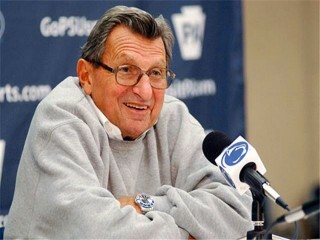 The American Football Coaches Association presented Paterno with its highest honor in 2002, the Amos Alonzo Stagg Award. The award honors those "whose services have been outstanding in the advancement of the best interests of football." In 1998, he was the initial winner of the Eddie Robinson Coach-of-the-Year Award, which recognizes an active college coach who is a role model to students and players, an active member of the community and an accomplished coach. Paterno died of complications from lung cancer on January 22, 2012 aged 85. View the full website biography of Joe Paterno.